It is, perhaps, all too easy to take for granted what being a Canadian is; both a reminder and a celebration of that can help us grow as a country of communities, which in turn celebrates and integrates the strength and exciting opportunities of our incredible diversity. 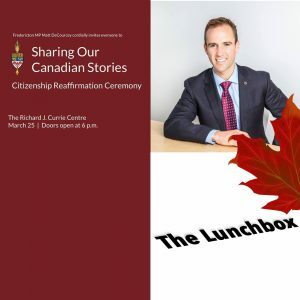 My guest today is Fredericton MP Matt Decourcey, who took some time out of a very busy day of budget announcements in Ottawa to talk about the upcoming Citizenship Reaffirmation Ceremony, which is subtitled “Sharing Our Stories”. He discussed how this idea took hold last year, and his hopes for our chance to come together as one community across Canada, seeing our diversity as strength in the wake of divisive politics and rising anti-immigration sentiment and action across the world. Sharing Our Stories: a Citizen Reaffirmation Ceremony welcomes everyone to the Richard J Currie Centre on UNB Campus on March 25 at 6pm.